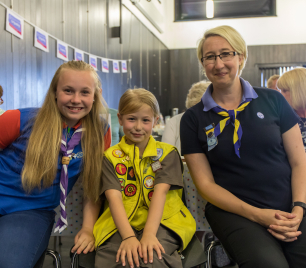 Poppy who attends the 13th Hastings Brownie unit was faced with a very difficult and daunting situation. To read Poppy's Story please click on the links below. 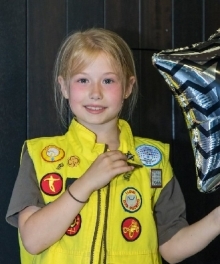 Poppy was presented the Guiding Star by LaSER Chief Commissioner Sally Christmas at a special ceremony in Hastings. 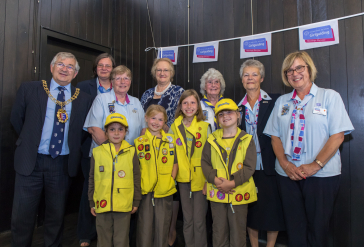 The presentation took the form of an Afternoon tea, Girlguiding Sussex East County members President Glyn Martin, Patron Sara Stoner, County Commissioner Linda Dupret, were joined by the Mayor and Deputy Mayor of Hastings also attending was Janice Pettit from the Regional Awards Panel, Poppy was also joined by her Family and Brownie friends. 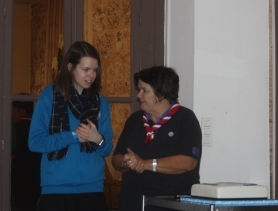 As well as receiving the Guiding Star Poppy also was given a personal letter from the Chief Guide Amanda Medler. Beth Willard joint Hastings Division Commissioner also presented Poppy with a Teddy Bear and Mum Ruth with a bouquet of Flowers. Poppy has also received a Public Commendation Award from South East Coast Ambulance service for her actions which coincidently was presented on World Thinking day. 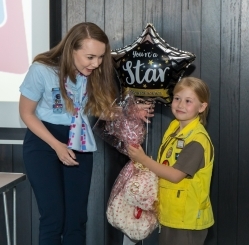 Poppy is a truly inspirational young lady and Girlguiding Hastings Division are extremely proud of her. The 4th Guides are doing a kindness challenge this term, they did an evening about being kind to ourselves and mental health, this week was random acts of kindness for strangers. 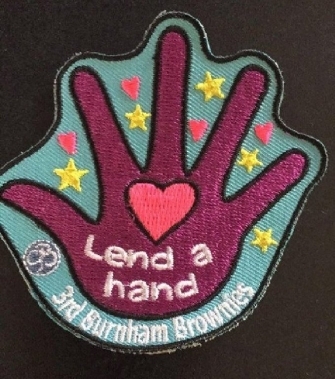 Girls who complete five acts of kindness receive a challenge badge put together by 3rd Burnham brownies. Below is a response we received on the Division Website. 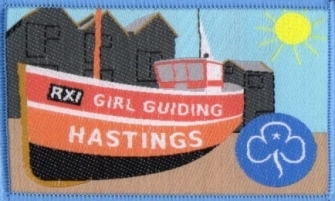 I would like to thank the 4th Hastings Guides group for making my day on Thursday 21st June. They were handing out roses to people at Aldis in Ore Village. I found mine on my works van with a message saying I rocked. I had a particularly hard day at work, and it brought a smile to my face. Well done Girls, a credit to Girlguiding Hastings. 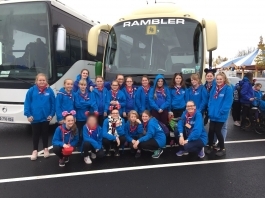 In October half term 2017 a group of 50 Guides, Senior section and leaders from the Division travelled to Paris as part of the Hastings Division International trip. We left Hastings early on Monday morning and travelled by coach to Folkestone where we took the shuttle to Calais. We then drove for 4 hours arriving at our accommodation at PGL chateau de Grande Romaine in the early evening. The next day everyone was so excited as we were going to Disneyland Paris. We split up into smaller groups, and experienced the exciting rides and shows that the parks offer. 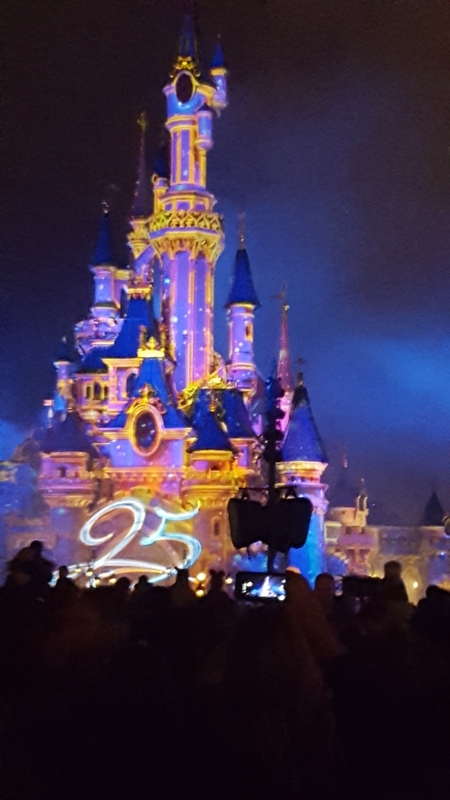 We stayed in the parks all day, Meeting Disney favourites like Minnie,Micky and Pluto as well as Pinnochio, leaving very late at night after watching an amazing firework and light show over the Disney castle. It was truly magical. We got back to the accommodation very tired, but went straight to bed ready for an early start the next day. On Wednesday we returned to the parks to do the rides and see the shows we had not seen on Tuesday. We left Disneyland earlier that day returning to have dinner at the Chateau de Grande Romaine. After dinner one of the PGL staff did an indoor activity with the girls. We then had a surprise presentation. One of our leaders Clare had achieved her Queens Guide award. Clare had worked extremely hard to get this award and was presented with it at the Houses of Parliament. As Clare was a leader with the Blacklands Brownies before moving away earlier in the year we wanted to put on a celebration for her from us. So we had a special cake made, and gave her a card and present. It was a complete surprise to her, and nice for us to be able to recognise her achievement. After all the excitement of the day we returned to our rooms to pack as we were sadly going home the next day. Thursday we left the accommodation waving goodbye to our PGL friends including Heather and Luke who had looked after us so well during our stay. We drove for several hours again finally reaching Calais to catch the shuttle back to Folkestone, stopping for lunch on the way. We watched films on the coach to pass the time. Late on Thursday afternoon we arrived back in Hastings to meet our parents and carers. We were all very tired but had had an amazing experience. This trip would not have been possible without the support of the adult leaders so thank you all for helping to make this trip such a success. Also we need to thank the charities who supported us with donations, Sussex East Guiding and the parents, carers and friends who helped us with our fundraising. Thank you to all the PGL staff at the booking centre, and also at the accommodation in France, especially to our groupies Heather and Luke.. And finally thank you to Rambler coaches and our coach driver Garth who was the most amazing and skilful driver, particularly on the very busy roads in Paris. 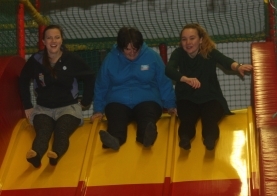 In December Rainbows, Brownies, Guides, Senior Section and Leaders got together for a Christmas party at the Clambers playcentre in Hastings. The event was a great success with fun had by all. 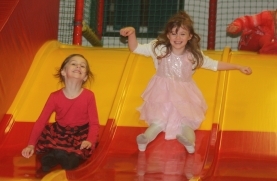 The girls played in the play areas, danced at the disco, and ate lots of scrummy party food. It was lovely to see Rainbows, Brownies and Guides playing together and meeting other girls from other units. This was the last event I organised as Division Commissioner. 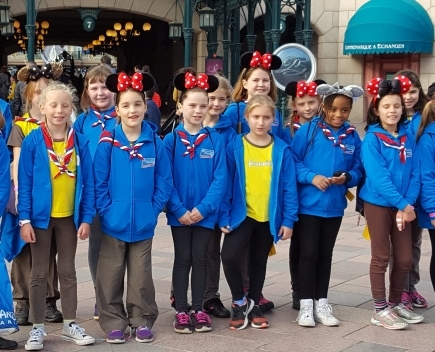 Sussex East County Guiding had awarded the Division a grant which paid for the evening, and gave everyone in the Division the opportunity to come. Tina and Beth the new joint Division Commissioners presented me with a beautiful bouquet of flowers and lovely presents from the Division to thank me for my work in the Division Commissioner role. One present was an afternoon tea voucher, which I shall enjoy with my husband Kevin who has been a great support to me in my Commissioner role over the years. Our Division secretary Karen Colthurst was also presented with a thank you gift as her role has also now ended. 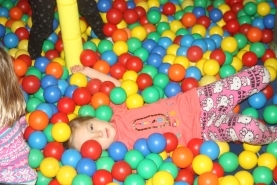 We should like to thank the staff at Clambers playcentre for looking after us so well, and the County for awarding us the grant to make it possible. Janice and Kevin Harmer were presented with an Award for oustanding long service to the Hastings Half Marathon. 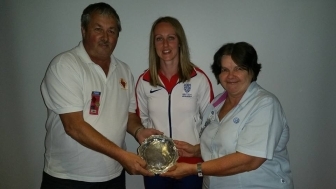 The award was presented by local International Heptathlete Elise Lovell at the Hastings Half Marathon Awards evening.